HTC has officially unveiled the smaller version of its HTC One (M8) flagship – One Mini 2. 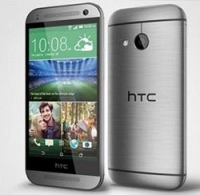 HTC One Mini 2 this time has a dimension of 137x65x10.6 millimeters and weighs 137 grams. Super LCD2 screen size is 4.5 inches, the screen resolution is the same as last year's model (720x1280) with a slightly lower density of 326 ppi (Mini One was 342 ppi). The interior of the casing hides quad core Qualcomm Snapdragon 400 SoC clocked at 1.2 GHz, Adreno 305 GPU, 1 GB of RAM, 16 GB of internal memory and BoomSound stereo speakers. Unlike the original Mini, Mini 2 has the option of expanding the internal memory via micro SD card. Supported Micro SD card are up to a maximum capacity of 128 GB. For video calls (and occasional selfie) there is the front 5 MP camera, while for everyday photography there is a rear camera with a resolution of 13 MP. As far as the operating system is concerned, HTC made sure to deliver the latest in Android KitKat (4.4.2) version, which is updated as usual with HTC's Sense 6 interface. Since this year's Mini comes with powerful components HTC has equipped it with a better battery which now has a capacity of 2110 mAh. The device will arrive on sale in June at a price of 400 euros.